Cameron: The 1990s were a booming era for science fiction on television, particularly military sci-fi shows. (The X-Files and Quantum Leap are notable exceptions.) Star Trek: The Next Generation eventually gave way to new Trek spinoffs Deep Space Nine and Voyager, the latter anchoring Paramount Pictures’ new broadcast television network, UPN. MGM and Sony countered with Stargate SG-1, a wildly successful and long-running show for both companies, and one that would spawn two spin-offs of its own (Stargate: Atlantis in 2004, Stargate: Universe in 2009). Meanwhile, J. Michael Straczynski’s diplomacy-oriented series Babylon 5, despite initially falling victim to the war for the “fifth broadcast television network slot,” became a favorite due in part because of Straczynski’s frequent visits to the show’s BBS conversations, plus the indication of planned story arcs that was daring to push the limits of what television was capable of at the time. But it’s important to note the militant and political aspects of these shows, because starting with Farscape, that perspective began to fall under scrutiny. If this is the aggressive side of sci-fi, the ones who go on the attack when the chips are down, then where are the little guys, the ones who fall between the cracks when stuff hits the fan? Farscape is by all accounts a bizarre show, but it’s one anchored by that desire to explore an alternate side of interplanetary conflicts. In this case, it’s a living ship, her Pilot, and her strange assortment of prisoners, including a prisoner of fate, protagonist John Crichton (Ben Browder). The basic plot of every episode (despite the fact that show gets increasingly more serialized) is that these prisoners are all looking for “home”—including what, exactly, they can define as home. 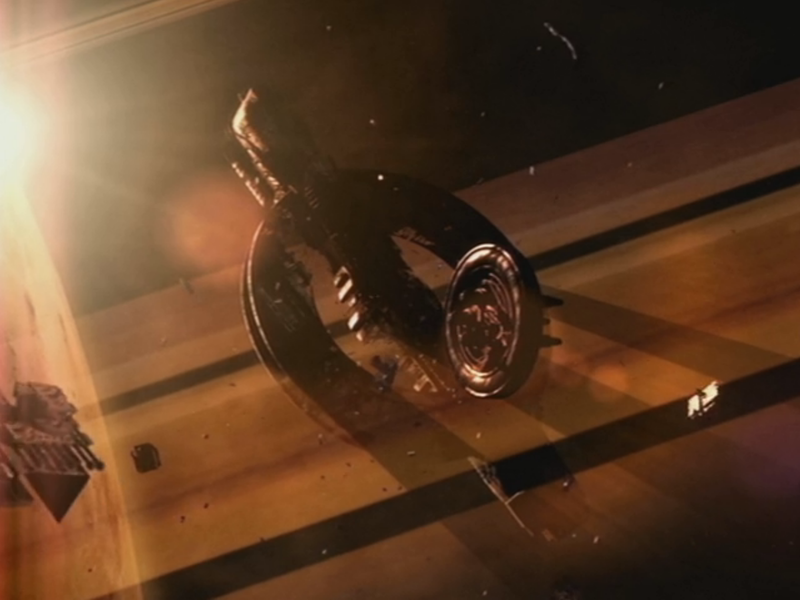 As the opening credits point out by reiterating the basic plot points of the pilot episode, John was sent flying into a distant part of the universe during an astronomy experiment on wormholes. (Given how we currently understand wormholes, this also means he was probably sent into the future, too—for more information, watch the part in the Community episode “Mixology Certification” where Abed explains to Paul F. Tompkins his theory about the show’s use of a wormhole as the inciting incident of the series.) The other characters also have reasons why they cannot go back to the image in their head of what home was… or else, they choose not to, fearing the consequences. Those reasons are explored throughout the first season, and particularly in the first seven or so episodes (of which today’s episode, “PK Tech Girl” is the fifth to air but the seventh produced; most of Farscape‘s first season aired in a vaguely mixed-up, Firefly-esque manner), the focus is on relating the characters back to John, who may or may not be the only human soul on Moya. Rewatching “PK Tech Girl,” I was reminded of one of Farscape‘s greatest strengths: its ability to take one incident and spin various threads that all relate back to that one incident. It’s very high-concept, which is exactly where it should be pitched. In this case, the incident is Moya and crew discovering a ruined Peacekeeper ship, the Zelbinion. The ship, a legendary one based on Aeryn Sun’s reaction to it, sparks three separate-but-related threads. John and Aeryn board the Zelbinion and discover a survivor, Gilina (Alyssa-Jane Cook), the titular Peacekeeper “tech girl.” This sparks a classic “awkward moments in television” plot wherein John and Gilina fall for each other while Aeryn, the series regular and therefore presumed love interest for John, is left out. Though this one plays out as one might expect, it works to expose some of Aeryn’s flaws as a person (well, Sebacean), and through this, she relates to John’s sense of loss about his own home planet. The loss is still fairly recent for John compared to Aeryn, but the impact is the same no matter how long it’s been. In the second plot, Dominar Rygel XVI (voiced by Jonathan Hardy), or Rygel for short, refuses to commit to his usual act of looting the derelict ship due to the heinous tortures he suffered at the hands of a Peacekeeper captain on the Zelbinion sometime in the past. Pa’u Zotoh Zhaan (Virgina Hey in chemically-damaging body paint) suggests that Rygel confront his fears, which eventually leads him to the corpse of the captain within the bowels of the ship. This is loss by another path. Rygel is characterized by his selfishness and pretentiousness; he’s an educated ruler trying to get back to his kingdom and its people. That makes him mostly unlikeable for a while, but this episode layers him with a deep and personal wound: torture. And it’s not just the torture itself, but the man who administered it, that Rygel must face in order to try and sleep better at night. But no amount of gooey spit on a skeleton’s skull can recover the loss of spirit that Rygel suffered. Rygel’s home, therefore, is psychological, but no less lost than John’s Earth, or Aeryn and Gilina’s places in the Peacekeeper ranks. The third plot is more hopeful than the other two, in that Zhaan and Ka D’Argo (Anthony Simcoe) attempt to buy time for John and Aeryn when the scavenging Sheyang return to clean up the remainder of the Zelbinion. D’Argo, a Luxan, is preternaturally aggressive, but with the help of Zhaan and Pilot, he manages to turn that aggression into an unusual form of diplomacy. In this plot, the show gives us a glimpse at an upside of the tragic circumstances that landed these former prisoners together: it’s a chance to gain something, to build a new home for yourself out of whatever pieces of yourself are left from the old one. Diplomacy and peace are not in D’Argo’s nature any more than violence and aggression are in Zhaan’s, but together, the two can do great things. But all three plots wrap back to the Zelbinion, and the Peacekeepers, the military force that owned and operated it for notorious purposes. The Federation doesn’t look so shiny from the outside. 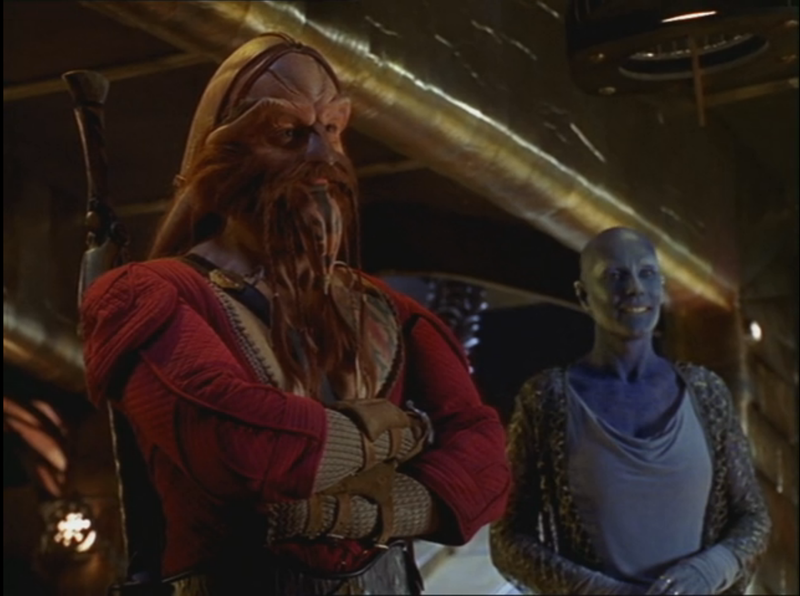 Science fiction is an excellent genre for exploring the points-of-view of the disenfranchised, and Farscape was just one great example of why that fact remains true. Conceptually, Farscape‘s premise has a lot in common with Buck Rogers in the 25th Century—modern-day astronaut is catapulted across time and space to an alien universe—but it’s obviously a much better show, and not just because it’s devoid of midget robots and space vampires. (Even though I’d have loved it if the latter were included, obviously.) Buck didn’t seem to lose any sleep over being dropped in a new world, and it was barely acknowledged save for a few references nobody got (something Farscape also does as John mentions Clint Eastwood and doctorates to a succession of blank stares). John however enjoys no such luxury—marked for death by a brutal military commander, in a crew who finds him as strange and untrustworthy as he does them, marooned on the fringes of space with little to no hope of returning home. There’s a sense of adventure here, but it lacks the intrinsic support system that both Enterprises enjoyed in being representatives of the Federation. Moya‘s crew has no one else to count on, no real training to fall back on, and always have their backs against the wall, and I think that raises the stakes in an important and entertaining way. 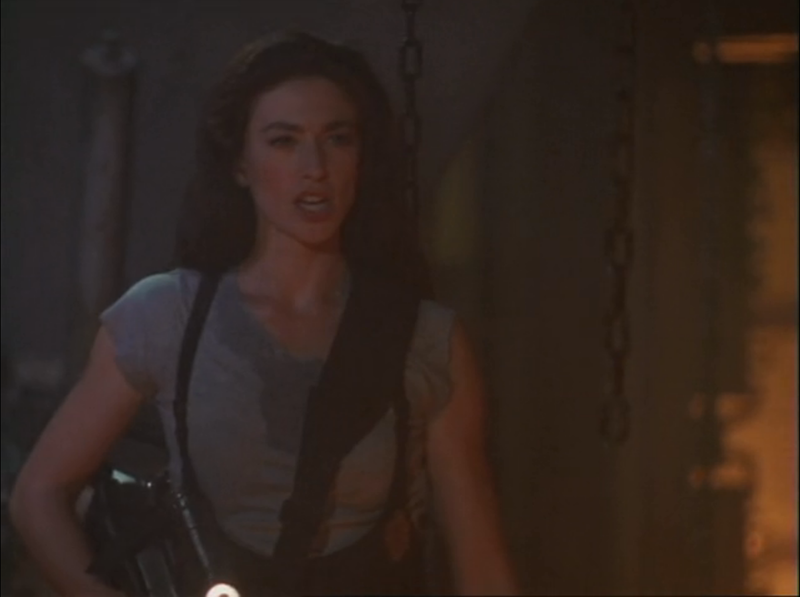 *That being said, for much of the episode I was very distracted by the fact that Claudia Black’s vast body of voice acting includes many video games I’ve played, including Mass Effect, Uncharted and Dragon Age: Origins. I half-expected her to throw out one of Morrigan’s acidic quips in response to seeing Crichton and Gilina making out. I also want to praise the show’s aesthetic. 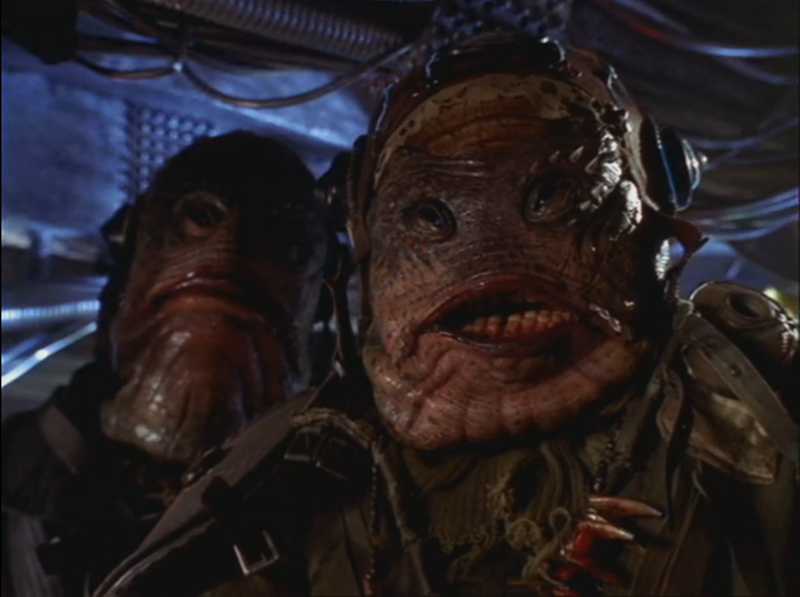 After a few episodes where the alien makeup has been minimalist or outright silly, this is a show that’s fully committed to a more elaborate universe, and it shows in every detail—the elaborate makeup and prosthetics used on Zhaan and D’Argo, the fluidity of Moya‘s design, and the remarkable functionality of the Rygel and Pilot puppets. Jim Henson’s son Brian was one of the show’s creators, and The Henson Company DNA runs clearly through this show in the latter, as well as the design of the toadlike Sheyang. This is a show that doesn’t look like anything we’ve watched in this roundtable, the first show where everything’s felt truly alien as opposed to futuristic, and it was a design that was executed extraordinarily well. 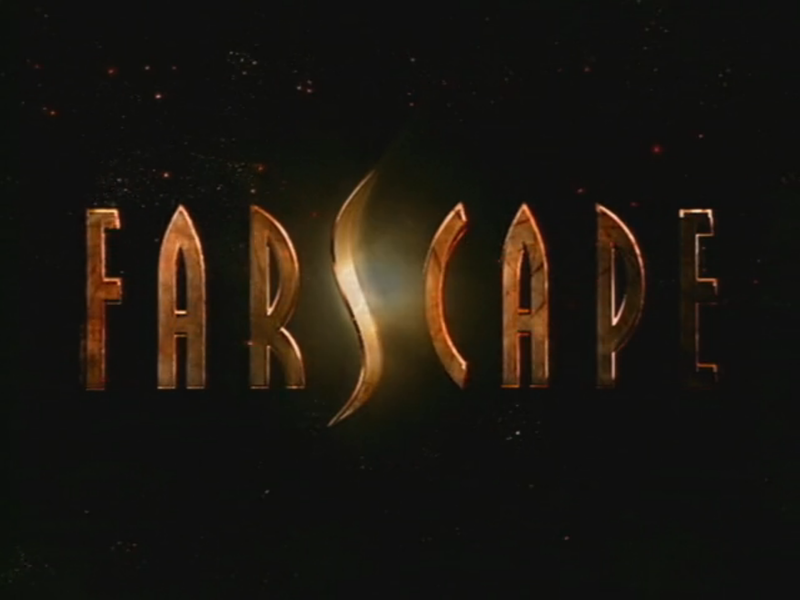 But I will say, after seeing that Cult creator Rockne O’Bannon was behind this show, I was disappointed Farscape didn’t tell me what just snaps right off. J.: My exposure to Farscape is practically nonexistent—I knew the show existed, but knew nothing of the concept or characters. And for the first ten minutes or so, I was getting the impression that I was better off that way. Our hero (with his square jaw and obvious 1990s pop culture references) was uninspiring, the puppets off-putting, and the exposition little more than a pile of unintelligible proper nouns. I gave a thought to simply turning it off and checking out of the roundtable this week. Fortunately, I stuck it out, because “PK Tech Girl” turned out to be pretty good. My favorite moment came in the final scene, where John’s guard comes down a little, and we see that those pop culture references he makes aren’t just tossed-off asides to the audience. He deeply misses his home, and the wacky adventures aren’t going to change that. Again, contrast that with Buck Rogers, who didn’t seem all that bothered by his predicament. We’ve come a long way from the kiddie sci-fi shows we’ve covered, and Farscape demonstrates that with the seriousness and maturity that were sorely lacking from Battlestar Galactica. Next week the space opera roundtable comes to a close, with a look at the pilot of the 2004 Battlestar Galactica reboot “33” (available through Netflix Instant and Hulu). At that time, we’ll also announce the next roundtable topic and lineup.